ANCHO can provide bespoke meeting and training room facilities which occupy part of our offices. We are located in the heart of Irvine town centre, easily accessible by car bus and train. Our meeting room can be hired by the half-day or day and come fully serviced by our own staff. It is a large conference room which can be used for training courses, meetings, seminars, AGM’s, exhibitions and presentations. It can be set out in a variety of configurations from meeting style, to classroom style to theatre style. 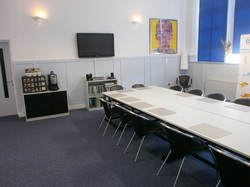 The room will comfortably hold up to 20 people for a meeting and up to 30 theatre style. Rates include tea/coffee and water facilities, use of flipcharts and reception service.